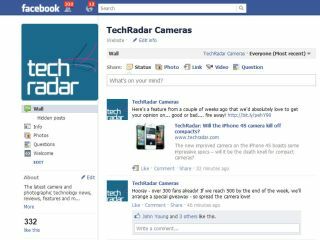 We have launched a new Facebook page dedicated to our the coverage from our cameras channel, brought to you by TechRadar's photography testing team. As many of you will know, we already have a Facebook page for TechRadar as a whole, but we also know that many of you are as obsessed with cameras and photography equipment as our testing team and decided to launch a page just for you. On the page, you'll find no mention of tech that's irrelevant to your interests, instead we will be focusing on the latest cameras, lenses, photographic equipment and industry news. The testing team also looks after the photography magazine reviews in our publisher's (Future) photography portfolio, so if you have a question about any reviews or camera news you have seen, or would like to see, in Digital Camera, PhotoPlus, Practical Photoshop or N-Photo do let us know. We'll also bring you the latest reviews from our independent and authoritative testing team, bring you sneak previews of new cameras, show you exclusive test pictures and you'll be the first to know when a new camera has arrived in the office ready for us to put it through its paces. If you're really lucky, we'll also organise the odd special giveaway as a thankyou for liking us - we're generous like that. So - if that all sounds like your cup of tea, what are you waiting for? Head on over to the TechRadar Cameras page and get liking!